The Chipotle at 9733 Sawmill Parkway in Powell was temporarily shut down on Monday after several customers reported becoming ill after eating at the restaurant. The business reopened Tuesday afternoon. 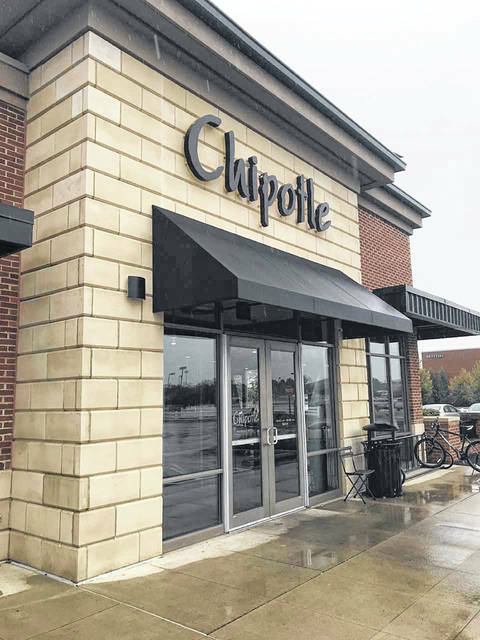 The Chipotle restaurant at 9733 Sawmill Parkway in Powell was temporarily closed Monday through Tuesday morning after several customers reported becoming ill following visits to the restaurant. Traci Whittaker, public information officer for the Delaware General Health District (DGHD), told The Gazette on Tuesday that the shutdown was voluntary by ownership, and the restaurant reopened Tuesday afternoon. According to the DGHD website, the health district received notification on Sunday from five patrons who had become ill after eating at the location on Saturday. In separate notifications, two more people reported sickness after eating at the Powell Chipotle on Friday. DGHD also noted at least two employees called off work due to excluding illness symptoms on Sunday and Monday. According to Chipotle management, no ill employees were working while symptoms occurred, and per company rules, employees are not cleared to return to work until 72 hours after their symptoms have subsided. Due to the complaints from customers and the staff call-offs, Chipotle voluntarily shut down for deep cleaning and sanitizing, as well as the removal of all exposed open foods and single-use equipment. DGHD indicated all temperature logs were proper during the days in which customers became sick, and the health district found no violations during inspection, following the complaints. As of 4 p.m. on Tuesday, Whittaker said there had been a total of 368 inquiries related to a possible foodborne illness outbreak at the restaurant. Thirty-three stool sample kits were delivered Tuesday to persons who reported illness, and the investigation is ongoing, pending lab results. During an inspection by DGHD on July 26, Chipotle was notified of two critical food safety observations regarding food temperature. According to the DGHD website, one critical observation was for lettuce that was being held at an improper temperature in the walk-in cooler, and the other was for pinto beans that were below the targeted temperature. Both incidences were marked as corrected immediately. DGHD also noted great hand-washing discipline at the Powell location during the inspection. The facility was inspected again by the health district on Tuesday with no issues reported. Chipotle, which has had incidents in the past in which customers became ill after eating at the restaurant, saw its stock fall nearly 7 percent by Tuesday afternoon as word of the Powell closing spread nationwide. DGHD urges anyone who consumed food from the Powell Chipotle between July 26-30 and have experienced nausea, vomiting and/or diarrhea, to call 740-368-1700 and ask to speak with a member of the Communicable Disease Team. https://www.delgazette.com/wp-content/uploads/sites/40/2018/08/web1_Chipotle.jpgThe Chipotle at 9733 Sawmill Parkway in Powell was temporarily shut down on Monday after several customers reported becoming ill after eating at the restaurant. The business reopened Tuesday afternoon.